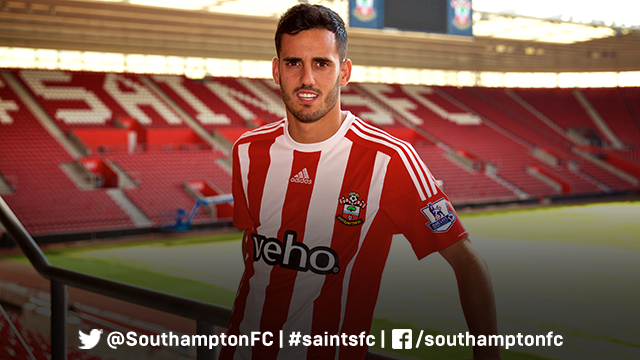 22-year-old Spanish international forward, Juanmi joined Saints on 16th June from La Liga side Málaga. Juanmi - full name Juan Miguel Jiménez López – was born in the Spanish town of Coín, near Málaga, on 20th May 1993. He joined Málaga at an early age and broke into the first team towards the end of the 2009/9 season, at the age of 16. He came on as a substitute for his debut and scored, making him the club's youngest ever goal scorer. He had to wait until early in the next season, before he made his first full appearance, against Real Zaragoza, where he scored twice in a 5-3 win. Although representing Spain at U16, U17 and U19 levels, he found games at club level hard to come by under manager, Manuel Pellegrini (now managing Manchester City). Juanmi spent half a season on loan with second-division side Racing Santander, but failed to score in 19 appearances as the club was relegated. The following 2013/14 season he found himself back at Málaga playing under a new manager. Juanmi then had to wait until October for his first team chance, but was regularly involved from then on, scoring 5 goals in 24 appearances. It was the following 2014/15 campaign that really saw Juanmi finally arrive, scoring 8 times, including the winner in a 1-0 away game against the mighty Barcelona. On 23rd March this year he found himself included in the Spanish squad for a EURO 2016 qualifying game against Ukraine and then a friendly with Holland. Having been an unused substitute for the first game, he then played 62 minutes of the Dutch game. Juanmi leaves Málaga having played 95 games and scored 21 goals during six seasons. Les Reed was quoted as saying: “Juanmi is a young, exciting and attacking player who fits into the club’s strategic plan perfectly"